When two individuals face off in conflict, the classic problem in evolutionary biology known as the prisoner's dilemma says that the individuals are not likely to cooperate even if it is in their best interests to do so. 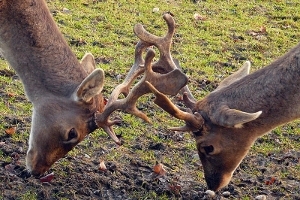 But a new study suggests that with incentives to cooperate, natural selection can minimize conflict, changing the game from one of pure conflict to one of partial cooperation. The findings, published online in the Proceedings of the Royal Society B, suggest that the prisoner's dilemma game, which has reigned as the dominant theoretical paradigm used to explain the costs and benefits of the evolution of cooperation, is not as evolutionarily stable a strategy as once assumed. In the prisoner's dilemma game, both players have the incentive not to cooperate independently. Collectively, they would be better off if they did cooperate. Evolutionary biologists have long sought to explain how cooperation can be maintained in such conflict by considering conditional behaviors in repeated interactions such as reciprocity. The new study, on the other hand, tries a different tack. Instead of accepting the underlying conflict of the prisoner's dilemma game as immutable, they consider whether so-called "mutants" can invade a population of prisoner's dilemma players and change the nature of the game. "We wanted to look at how payoffs from social interactions can evolve, and what we found was that in the case of prisoner's dilemma, mutants that provide incentives to each other for cooperating can invade, which changes the game to one of partial cooperation or coordination," said Erol Akçay, the study's lead author and postdoctoral researcher at the National Institute for Mathematical and Biological Synthesis. Akçay and co-author Joan Roughgarden, professor of biology at Stanford University, developed a mathematical model to illustrate how payoffs evolve in behavioral games as a result of evolution of individual traits. The model showed that when animals are able to recognize their payoffs and have the potential to react to incentives, the problem of the prisoner's dilemma is less likely to occur and instead the game becomes more cooperative. The results also showed that polymorphism, a genetic variant that can change the way a particular gene functions, is possible under a wide range of conditions, which results in a single population playing a variety of different behavioral games. The findings suggest that diversity in behavioral games could be more common in nature than previously recognized and might account for the diverse behavioral traits seen in nature. Akçay E, Roughgarden J. 2010. The evolution of payoff matrices: providing incentives to cooperate. Proceedings of the Royal Society B. Published online 8 December 2010.